It may not hold the kudos that it’s bigger brothers the Galaxy S series and the Galaxy Note series do but is still has a great range of Samsung technology that makes it worth a second look. 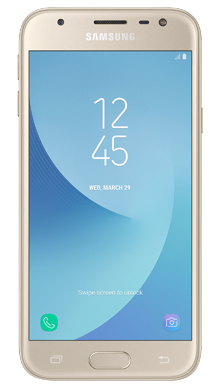 Select your desired options to find the best Samsung Galaxy J3 2017 deals for you. When it comes to big names in mobile phone technology Samsung has to be one of the top, in fact, most people would agree it sits in the top two next to rivals Apple. This means that it also has a vast range of handsets on offer, as the manufacturer sensibly tries to appeal to all users by presenting mobile phones at all levels. The Samsung Galaxy J3 2017 sits somewhere in the mid to lower spec end of their collection and is a smartphone with plenty to offer. It may not hold the kudos that it’s bigger brothers the Galaxy S series and the Galaxy Note series do but is still has a great range of Samsung technology that makes it worth a second look. 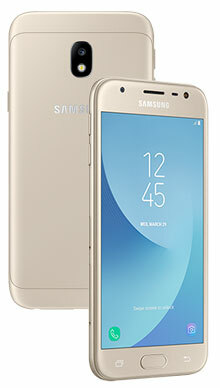 Of course, the other selling point is that the Samsung Galaxy J3 2017 comes with a smaller price tag and is therefore ideal for those who want to own a smartphone by one of the leading retailers but at the same time have a smaller budget to play with. You get the benefit of Samsung magic without having to break the bank. In terms of design, the Samsung Galaxy J3 2017 looks and feels much like any other smartphone. There is a bezel edge, but the screen area seems plentiful and is well thought out but does not feature any form of water resistance which could be a concern, and something that Samsung addressed in newer models. On the rear of the handset, which is tastefully formed in metal, the rear camera sits flush to the back and does not stick out like some models. The handset is 8.2mm thick and sits nicely in the palm of the hand. The Samsung Galaxy J3 2017 is made from a curved glass that has a 2.5D finish, and the overall size of the display is 5-inch high definition. Streaming video from this handset gives a pleasing result on the 720x1280 resolution screen. This is thanks in part to the fact that the Samsung Galaxy J3 2017 comes with the Super AMOLED screen that we have become used to from Samsung rather than the LCD screen that featured on the previous model. Samsung does not do audio badly. 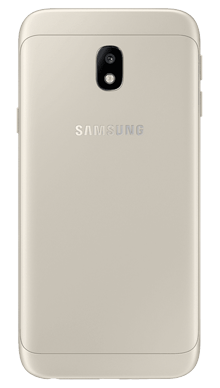 However, the Samsung Galaxy J3 2017 is by no means the best on the market, as this is still a budget end phone. That said with headphones in you will find that your music sounds reasonable enough. 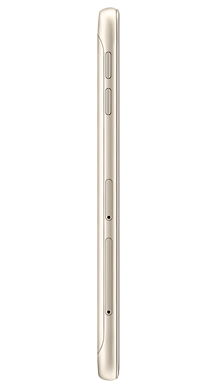 The Samsung Galaxy J3 2017 even features the standard headphone jack. If you are looking for a mid-range phone that takes quality photos the Samsung Galaxy J3, 2017 could be the perfect solution. On the rear is a superb 13MP camera which rivals some of the high-end phones while the front-facing camera is 5MP and does come with an LED flash. This gives selfies a lovely light quality even in low light. 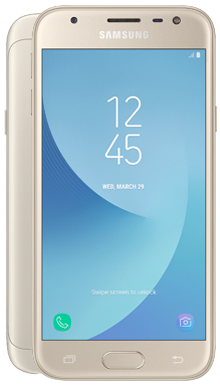 If you are looking for a reasonable storage level, then you will not be disappointed with the Samsung Galaxy J3 2017 either, as it features onboard storage of 16GB, but as with most of their phones, you have the MicroSD slot offering a good amount of expansion. For this model, Samsung has given a maximum SD card size of 256MB which is pretty good and should meet the needs of most users. If you need more storage, you could, of course, have a second card and swap them out. When it comes to battery size, Samsung has opted to give the Galaxy J3 2017 a 2400mAh battery which could be seen as a downfall as others in the range do have larger battery capacity, but that said it still lasted well with a light day of use away from the charger. The Samsung Galaxy J3 2017 is running Android Nougat (7.0) which is something of a dated operating system but to be fair is adequate for a handset at this level and gives an excellent operating speed. Inside you will find the Exynos 7570 quad-core1.4GHz Cortex-A5 to help keep things ticking over nicely, although as with all smartphones some apps are so big they do cause a bit of lag. From a security point of view, it was expected that this handset would not feature any of the massively new features, so there is no facial recognition or fingerprint scanner, just the standard passcode features. However, the Samsung Galaxy J3 2017 makes up for this in other ways and is a cracking handset. The Samsung Galaxy J3 2017 is a smartphone designed to appeal to those on a budget and is definitely worth consideration. You will get the quality build of a Samsung that features a great about of functionally and Android awesomeness. It is worth noting that you do not get any level of waterproofing on this handset so be sure to keep it dry but you do get Bluetooth and some nice features like the ability to organise your apps into folders. To be sure you have access to the best Samsung Galaxy J3 2017 we have sent our staff on a mobile phone deal hunting mission and they have not disappointed. We have a range of awesome deals waiting for you. Metrofone has an exclusive partnership with EE because we want to make sure that our customers have access to the best in network service and connection wherever they live and no matter where they may roam. EE has also provided a stunning range of extra benefits to customers who choose one of their amazing deals, and these include access to Apple Music and BT Sport as well as international calling.